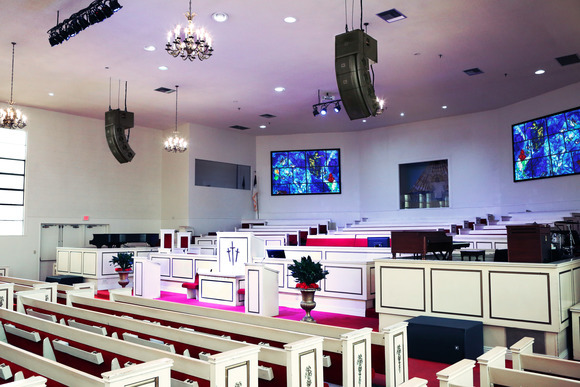 LOS ANGELES—Mount Moriah Baptist Church recently collaborated with Guitar Center Professional and Streamline System Designs to upgrade their sanctuary with a HARMAN Professional Solutions networked audio solution. Mount Moriah Baptist Church has been bringing people together to celebrate their faith since 1946. In order to provide pristine sound quality during services and performances, Mt. Moriah Church recently decided to upgrade their outdated PA system. Together with Guitar Center Professional (GC Pro) and leading commercial installers Streamline System Designs, Mt. Moriah Church deployed a full HARMAN Professional Solutions networked audio solution including JBL VRX932LA and PRX812W loudspeakers, VRX918S and ASB6128 subwoofers, Soundcraft Si Impact and Performer 3 mixing consoles, Crown amplifiers and BSS signal processors. Streamline System Designs equipped the sanctuary with state-of-the-art JBL VRX932LA-1 line array loudspeakers for their flat frequency response and high output levels. JBL VRX918S and ASB6128 subwoofers provide balanced low frequency response throughout the facilities. JBL PRX812W floor monitors deliver clear, intelligible sound for performers and speakers on stage. The system is powered with Crown DCi 4|2400N and DCi 2|2400N amplifiers. A Soundcraft Si Performer 3 digital mixing console offers flexible front-of-house mixing with on-board signal processing. The Performer 3 also features a built-in DMX 512 controller, allowing users to operate sound and lighting from the same console. An optional Soundcraft CAT5 MADI card and BSS BLU-SI BLU link card allow for quick and easy connectivity with the Soundcraft 5031234 compact stagebox. BSS BLU-50 signal processors offer simple signal routing throughout the facilities. In order to allow for a separate broadcast mix, Streamline System Designs installed a Soundcraft Si Impact digital mixing console, which provided flexible routing capabilities and intuitive workflow. © 2019 HARMAN International Industries, Incorporated. All rights reserved. Harman Kardon, Infinity, JBL, Lexicon and Mark Levinson are trademarks of HARMAN International Industries, Incorporated, registered in the United States and/or other countries. AKG is a trademark of AKG Acoustics GmbH, registered in the United States and/or other countries. Features, specifications and appearance are subject to change without notice.